Rider Colman Sweeney weighed 13st 10lb in November, yet at Cheltenham today he was a healthy 11st 4lb stripped before going out to ride Salsify in the Christie’s Foxhunter Chase. The weight loss was worth it, for Salsify proved himself the best hunter on either side of the Irish Sea by beating 3/1 favourite Chapoturgeon and Oscar Delta by a length and 11 lengths. Sweeney’s parents, Rodger and Joan, were present as trainer and owner. Colman, who won the Christie’s in 2005 on the Paul Nicholls-trained Sleeping Night, said: “The first win was good, but this is special because it’s for my parents. Last year my good friend Richard Harding rode the horse, because I got injured and had 18 months out of the saddle. During that time I got married, did a degree course in computers and put on a bit of weight, but in November my wife Niamh and my parents encouraged me to get fit and ride Salsify this season. “It was a big challenge to lose the weight but I did it by dieting and running. “On New Year’s Eve in a point he was beaten when carrying a lot of condition, and he could never travel on the ground at Thurles [pulled up] but he was much better at Leopardstown last time. The ground today helped. I dropped out early because he travels so well and he jumped brilliantly. 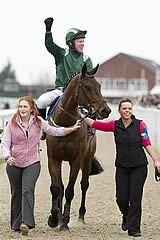 Rodger Sweeney said: “Tom O’Mahony bought this horse for us. We sold Micheal Flips here and with the money we bought three horses including this one. “We ran him in a couple of hurdles, but he ended up too highly handicapped so we went back to pointing. I’ll think about going back on the main track now, but the standard at home is so high and I won’t be in a hurry to take on Willie Mullins and the like. “We’re point-to-point people and we enjoy it, so to win this race is everything. There’s not a race I could want to win more. We were here when Colman won on Sleeping Night, but this caps it. The winning rider picked up a four-day ban - two days for using his whip once above the limit of eight, and two days for not giving his horse time to respond. Will Kinsey, who rode unplaced Surenaga, was suspended for five days for using his stick when out of contention. 1. The Christie’s Foxhunter Chase is one of the oldest races at the Festival. The first running in 1904 was won by the 6/4 favourite Palmy Boy, owned and ridden by Mr J Widger. It is now one of the richest and most prestigious hunter chases of the season, worth a total of £35,000. 2. In 2012, Christie’s, the international auctioneers and valuation experts, will be sponsoring the race for the 34th year (including the 2001 cancelled contest). 3. Since 1946 six horses have won the Foxhunter Chase twice although no horse has won it three times. The Callant won in 1956 and 1957, Whinstone Hill in 1958 and 1960, Colledge Master in 1961 and 1962, Double Silk in 1993 and 1994, Fantus in 1995 and 1997 and Earthmover in 1998 and 2004. 4. Caroline Beasley became the first female jockey to win a race at The Festival when successful on Eliogarty in the 1983 Christie’s Foxhunter Chase. Since then the race has been won four times by women - Katie Rimell on Three Counties in 1989, Polly Curling on Fantus in 1995, Fiona Needham in 2002 on Last Option and Rilly Goschen on Earthmover in 2004. 5. Three of the five 13-year-olds to have been successful at The Festival since 1946 have come in the Christie’s Foxhunter Chase - Earthmover in 2004, Merry, who dead-heated in 1953 and Greenwood in 1950. The other two 13-year-olds to have won were Approval in the 1959 Vincent O’Brien County Hurdle and Willie Wumpkins in the 1981 Pertemps Final. They are the oldest horses to have succeeded at The Festival in this period. 6. The Christie’s Foxhunter Chase is the only race at The Festival open to trainers who are not full-time professionals or hold a permit to train their family’s horses. 7. The Christie’s Foxhunter Chase is one of three races exclusively for amateur riders at The Festival – the others are the Diamond Jubilee National Hunt Chase and the Fulke Walwyn Kim Muir Challenge Cup Chase. 8. There have been five Irish-trained winners since Eliogarty won in 1983 – the others being Attitude Adjuster in 1986, Lovely Citizen in 1991, Whyso Mayo in 2006 and Zemsky in 2011.